Hume Riverina Community Legal Service is one of 54 statewide services today calling on Premier Daniel Andrews to address significant issues in rental laws that make life harder for renters struggling to get fair access to secure housing. The State Government’s current review of the Residential Tenancies Act is underway, and HRCLS principal lawyer Sarah Rodgers said the community legal centre joined the Make Renting Fair campaign to add its strong support for key areas of concern around potential reforms. These include increasing protection for low income and vulnerable tenants, removing ‘no reason’ eviction notices, implementing the Family Violence Royal Commission recommendations, and ruling out punitive measures that would harm tenants, particularly those at risk of homelesssness. “We know people experiencing family violence are at greater risk of homelessness and will be impacted by unfair tenancy laws,” Ms Rodgers said. Ms Rodgers said the service was committed to assisting this group of people, and there was no sign the homelessness problem in the North East was about to change. The Open Letter to Mr Andrews came in the wake of Homelessness Week, which was recognised on the Border with a launch in Wodonga last Monday. Beyond Housing (formerly known as Rural Housing Network) stated that in 2014-15 700 people presented to their service either homeless or at risk of becoming homeless. Of these 27% were couples/families, 33% were homeless for social reasons including family violence and 29% because of housing affordability. Ms Rodgers echoed the statement from the Make Renting Fair Campaign, saying the groups most impacted would include people who have been homeless, people living with mental illness, people with a disability, older tenants, students, people from CALD backgrounds, Aboriginal and Torres Strait Islander people, women and children, and low income households. “The challenges these groups face are often exacerbated in the country and in cross-border locations such as Albury-Wodonga,” she said. 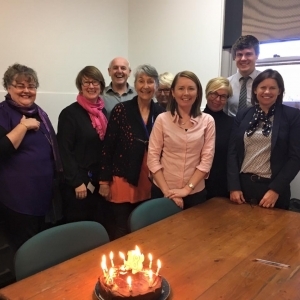 There was cause for celebration (and cake) on Friday July 28 when Hume Riverina Community Legal Service celebrated its 18th birthday, after Federal Attorney General Daryl Williams AM QC MP launched the service on that date in 1999. From humble beginnings – four staff and a budget of $200,000 – the service has grown to become an accepted and key member of the legal sector, locally and nationally, with 11 legal and five admin/community development staff. The team is also about to grow further, thanks to Legal Aid NSW confirming funding for the NSW Care Partner Program, and a family law/family violence role. While staff and budgets have changed, the commitment to providing a professional service for disadvantaged and vulnerable people and families in North East Victoria and Southern Riverina of NSW remains as strong as it was on day one. HRCLS provides family violence and family law legal assistance, as well as generalist legal services on everyday legal problems, including fines, credit and debt issues, consumer complaints and motor vehicle accidents. Being auspiced by UMFC and with strong relationships in the community service sector, HRCLS continues to work together with other services, such as financial counselling and drug and alcohol support for clients struggling with multiple issues in their lives. From the beginning we have been a voice for rural, regional & remote (RRR) Australia, and we continue to speak up for this sector of our community, with a particular emphasis on the complex issues of living on the border through differing laws in Victoria and NSW. We are passionate about linking our community to the law, and our involvement in community legal education and law talks has continued to expand as our staff go out and about through our catchment of 17 local government areas, helping people to understand the law and how to access it. Our commitment to law reform has long been a foundational pillar of our service and we continue to work for a fairer and more just society. Most recently we have been involved in the Access to Justice Review in both Victoria and NSW, the Royal Commission into Family Violence in Victoria and the Elder Abuse Inquiry (Vic). We are grateful for the community support over the past 18 years and look forward to continuing to make a difference in our region by providing free legal advice to people who otherwise can’t afford a lawyer. Reaching 18 is worth a celebration and cake! It’s been a wonderful journey making a difference with free legal assistance for vulnerable people and families in our community. http://hrcls.org.au/wp-content/uploads/2016/08/logo-300x107.png 0 0 hrcls http://hrcls.org.au/wp-content/uploads/2016/08/logo-300x107.png hrcls2017-08-16 11:16:452017-08-24 09:04:17Happy 18th Birthday HRCLS! Hume Riverina Community Legal Service marked World Elder Abuse Day on June 15, 2017, by visiting aged care facilities in Wangaratta to raise awareness about the issue. 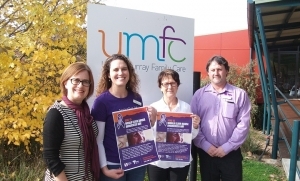 Hume Riverina Community Legal Service principal lawyer Sarah Rodgers said elder abuse was generally carried out by a trusted family member or friend, and impacted a person in a number of ways, and legal assistance was needed in most cases. Ms Rodgers said HRCLS visited aged care facilities because aged care and health care workers, including nurses, may see elder abuse first hand and can offer support, particularly if they see a negative change in behaviour or learn of financial transactions happening without permission. Ms Rodgers said it was important elderly people had their legal affairs in order to help reduce the risk of elder abuse occurring. Older Victorians experiencing elder abuse, or family members concerned about an older person, can contact Hume Riverina Community Legal Service for free legal advice. Appointments can be made by calling 1800 918 377. HRCLS is auspiced by UMFC who also offer assistance for over 65s through their Support Options Program, providing a range of services for the aged and those who care for them. For more information call 02 6055 8000 or 03 5720 0000. Financial abuse:Using someone’s money, property or other assets illegally or improperly or forcing someone to change their will or sign documents. This is the most common form of abuse seen in Victoria. Emotional abuse:Using threats, humiliation or harassment causing distress and feelings of shame, stress or powerlessness. Physical abuse:Inflicting pain or injury by hitting, slapping, pushing or using restraints. Social abuse:Forcing someone to become isolated by restricting access to family, friends or services. This can be used to prevent others from finding out about the abuse.